CallTrackingMetrics’ real-time agent reporting provides you with a live dashboard view into the current activity in your call center. With one glance, you will know your current call volume, what your agents are doing, and how performance has been for the day so far. In conjunction with the reporting CTM provides on calls driven from your online and traditional advertising channel performance, it’s important for you to know what is happening with those calls once they hit your call center. Customers use this information to identify performance issues in their call center and to understand which advertising channels and agents are leading to the most conversions. As calls come in to your tracking numbers, you and your call center agents will see them in real-time. Agents can enter notes, emails, scores, and conversions for each of their calls right in the call log. Associate conversions, ratings, and call quality back to the correct advertising channel and agent. As a manager, you have the ability to listen to the recordings of all of your calls, live listen on calls as they happen, and send notes to your agents in the system about particular calls. 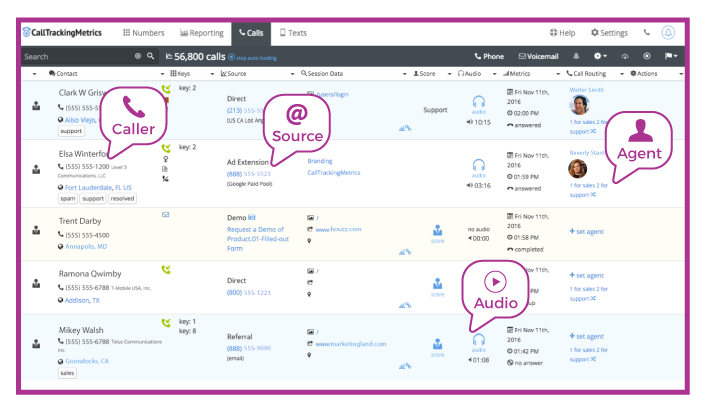 CallTrackingMetrics also offers integrations with systems like Salesforce so that your agents don’t even have to leave the Salesforce interface to see all the rich detail about the caller and update conversion and rating information.